One of the greatest American composers of the twentieth century, John Cage created music that defies easy explanation. Many writers have grappled with Cage’s music—which used notes chosen by chance, randomly tuned radios, and even silence—trying to understand what his music means rather than where it came from. 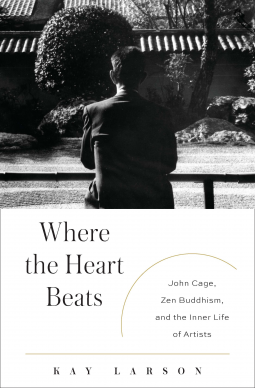 An unprecedented and revelatory book, Where the Heart Beats shows what actually empowered Cage to compose his incredible music, and how he inspired the tremendous artistic transformations of midcentury America.Where the Heart Beats is the first biography of John Cage to address the phenomenal importance of Zen Buddhism to the composer’s life and to the artistic avant-garde of the 1950s and 60s. Zen’s power of transforming Cage’s troubled mind by showing him his own enlightened nature—which is also the nature of all living things—liberated Cage from an acute personal crisis that threatened his life, his music, and his relationship with his lifepartner, Merce Cunningham. Caught in a society that rejected his music, his politics, and his sexual orientation, Cage was transformed by Zen from an overlooked and somewhat marginal musician into the absolute epicenter of the avant-garde. Using Cage’s life as a starting point, Where the Heart Beats looks beyond to the individuals he influenced and the art he inspired. His circle included Robert Rauschenberg, Andy Warhol, Merce Cunningham, Yoko Ono, Jasper Johns, Morton Feldman, and Leo Castelli, who all went on to revolutionize their respective disciplines. As Cage’s story progresses, as his students’ trajectories unfurl, Where the Heart Beats reveals the blossoming of Zen in the very heart of American culture.Both an innovative biography and a groundbreaking cultural history of the American century, Where the Heart Beats is the work of acclaimed art critic Kay Larson. Following her time at New York magazine and The Village Voice, Larson practiced Zen at a Buddhist monastery in upstate New York. Larson’s deep knowledge of Zen Buddhism, her long familiarity with New York’s art world, and her exhaustive original research all make Where the Heart Beats the definitive story about one of America’s most enduringly important artists.